In an interview with Neil Cavuto earlier this month, I mocked proponents of big government for their hysterical predictions of bad things happening under sequestration. And cartoonists had a field day making the same point (see here and here). The White House obviously wasn’t happy about the sequester, in part because they like bigger government and also because sequestration was a big defeat for the President. Well, now the Obama Administration sees a chance for revenge and redemption. The President’s appointees, by choosing to furlough air traffic controllers, are seeking to turn air travel into something akin to a visit to the Post Office or DMV. It’s clear that the White House hopes to recreate momentum for a tax hike as an alternative to sequestration. But they’re not exactly being subtle. The Wall Street Journal exposes the White House’s political motivated chicanery, starting with the very important point that the FAA’s budget – even after sequestration – is as large as it was in 2010. Yet the White House is manipulating the sequester to cause the maximum amount of inconvenience for taxpayers. 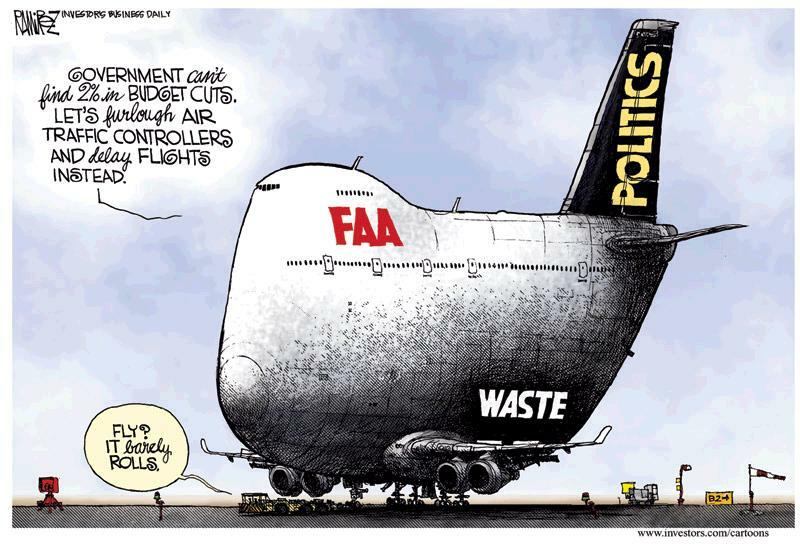 The sequester cuts about $637 million from the FAA, which is less than 4% of its $15.9 billion 2012 budget, and it limits the agency to what it spent in 2010. The White House decided to translate this 4% cut that it has the legal discretion to avoid into a 10% cut for air traffic controllers. Though controllers will be furloughed for one of every 10 working days, four of every 10 flights won’t arrive on time. The Obama Administration is pretending that it’s merely following the law, but the WSJ editorial debunks that notion. This is a political pose to make the sequester more disruptive. Legally speaking, the sequester applies at a more general level known as “accounts.” The air traffic account includes 15,000 controllers out of 31,000 employees. The White House could keep the controllers on duty simply by allocating more furlough days to these other non-essential workers. Instead, the FAA is even imposing the controller furlough on every airport equally, not prioritizing among the largest and busiest airports. …ever since Al Gore launched a training initiative to increase the productivity of air traffic controllers in 1998, productivity has continued to fall. A larger workforce is now in charge of a smaller workload as the number of flights has dropped by 23%. I didn’t realize that controllers were doing less work over time, but I’m not surprised to learn that superfluous bureaucrats at the FAA are being protected. But the WSJ doesn’t go far enough. My Cato colleague Chris Edwards has a column in the Daily Caller that outlines the inefficiency of the FAA. The federal budget sequester is interfering with the air traffic control (ATC) system and snarling up air traffic. As usual, politicians are pointing fingers of blame at everybody but themselves. But politicians are the ones who have strapped the ATC system to the chaotic federal budget. And they’re the ones who have insisted on running ATC as a bureaucracy, rather than freeing it to become the high-tech private business that it should be. …Last year Bloomberg reported: “More than one-third of the 30 contracts critical to building a new U.S. air-traffic system are over budget and half are delayed, a government audit concluded. Chris then takes the logical next step and says the system should be privatized. Which is exactly what happened in his home country of Canada. To run smoothly and efficiently, our ATC system should be given independence from the government. We should privatize the system, as Canada has done very successfully. …Canada provides an excellent model for U.S. reforms. Canada’s ATC system is run by the nonprofit corporation Nav Canada, which is separate from the government. Like any private business, it raises revenues from its customers to cover its operational costs and capital investments. The company’s financial statements for 2012 show revenues and expenses of $1.2 billion, with $125 million allocated to capital expenditures. Unlike the U.S. system, Nav Canada is self-supporting and not subsidized. I’ve already written on this topic, citing some good analysis from Canada’s Financial Post, and the evidence is overwhelming that the private system in Canada works much better than the inefficient bureaucracy we have in the United States. Let’s close with a Michael Ramirez cartoon. The “politics” and “waste” markings are very appropriate. Lost in this controversy, by the way, is any recognition that sequestration barely makes a dent in the federal budget. There are some small first-year cuts in a few programs, but the wasteful behemoth known as the federal government is barely nicked. To be more specific, the net effect of the sequester is that the burden of government spending grows by $2.4 trillion over the next 10 years rather than $2.5 trillion. So don’t pay any attention to the hyperbole and hysteria from the special interest groups in Washington. The sequester is a tiny – and desirable – step in the direction of fiscal responsibility. Why Can’t We Copy those Radical Free-Market Canadians and Privatize the Air Traffic Control System? Like most federal agencies, the Federal Aviation Administration is a costly bureaucracy. Its $16.4 billion budget is enormous, but that is just the direct cost borne by taxpayers. The indirect costs, such as inefficiencies imposed on the air transportation system, also are significant. This has nothing to do with the TSA, by the way. The FAA is responsible for the air traffic control system, things like airport towers and radar systems that tell planes where to fly and when to land. The Canadians have a much better approach. They privatized their air traffic control system back in the 1990s. So instead of having to rely on a clunky and incompetent government bureaucracy, our neighbors to the north have a private company that is generating very impressive results. Not that this should be a surprise. Other nations have made remarkable gains through privatization, including Social Security personal accounts in Chile and 30 other nations, education choice in places such as Sweden and the Netherlands, and privatized postal service in Germany. Reforming government monopolies should be a priority in the United States. Robust economic growth requires more than just low tax rates. It means getting rid of policies that cause resources to be misallocated. Privatization is an unsettling concept for some people, in part because they’ve always assumed certain things should be run by the government. This is why international examples are so important. Canada’s 14 years of experience with a private air traffic control system clearly shows that there are very successful alternatives to inefficient and costly bureaucracies. Here are some excerpts from a story in Canada’s Financial Post about Canada’s remarkable reform. A once troubled government asset, the country’s civil air traffic controller was privatized 14 years ago and is now a shining example of how to create a global technology leader out of a hulking government bureaucracy. Nav Canada’s efforts have flights moving more efficiently than ever through the skies above the country. Many of the changes implemented by Nav Canada in recent years have gone unnoticed by the flying public. Certain flights are now shorter than they once were; aircraft no longer circle airports awaiting a runway; descents start further out and planes reach cruising altitudes more quickly; and flights to Asia now spend less time by jaunting over the Arctic than endlessly cruising the Atlantic or Pacific Oceans. …Nav Canada estimates its efforts to modernize the aircraft navigation system in the country since it was privatized in 1996 have cut the fuel bill of airlines flying into Canada and above it by an estimated $1.4-billion collectively… Meantime, Nav Canada has won the respect of airlines for keeping its fees steady, and in some cases, like in 2006, even reducing them when it can. …John Crichton, Nav Canada chief executive, makes no bones about why he thinks his organization has been able to make these improvements and emerge as a global leader. I don’t think there’s any question that the privatization was the best thing that ever happened,” he said. “That really unleashed all the innovation.” …Calin Rovinescu, Air Canada’s chief executive, commended Nav Canada for its efforts to modernize the country’s navigation systems during a speech in Montreal earlier this year, while condemning the United States and the European Union, which still operates as a patchwork of nationalized systems, for their lack of leadership on the issue. Nav Canada also won the International Air Transport Association’s Eagle Award earlier this year for its efforts, in particular its constant consultation with the industry. My Cato colleague Chris Edwards has more analysis, including a call to private the Federal Aviation Administration as well as some useful links. Greetings to Instapundit readers. International Liberty is dedicated to the global fight for economic freedom. Peruse this site to your heart’s content. Feedback is always appreciated and come back often.